The Friends of Dumont Dunes in conjunction with the BLM Barstow Field Office are pleased to announce our 1st Annual Treasure Trunk or Treat! This is a huge effort to provide a safe and exciting trick or treat experience for all of the kids (and us big kids too!) during this Halloween season opener! Don't be shy! Get your costumes on, your OHVs decorated for display and don't forget to bring your own candy to pass out to the kiddos enjoying this event! You may end up winning one of the 5 different awards! 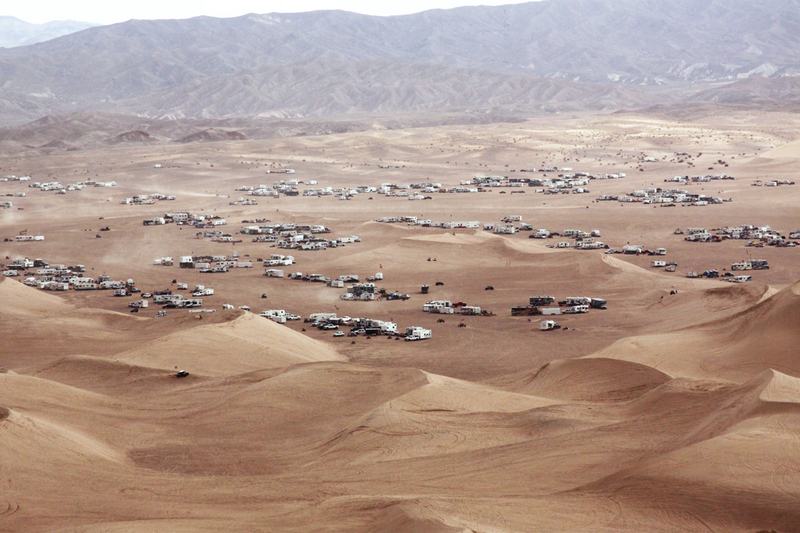 Please help Friends of Dumont Dunes spread the word. Hope to see you all and make this a great turnout Saturday night of Halloween Weekend! Let the dune season commence! Halloween marks the beginning of the 2017/2018 dune season. 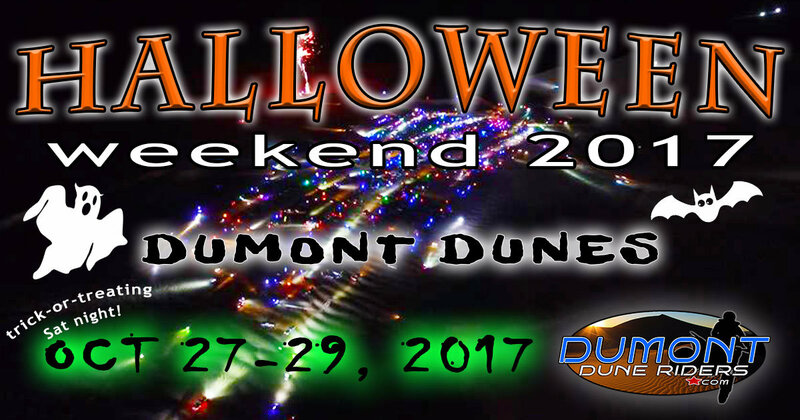 With the cooler fall weather arriving, packs of duners will be heading out to Dumont to celebrate the first holiday weekend on October 27-29, 2017. Although Halloween is on Oct 31st (Tuesday), trick or treating has always been a Saturday night tradition at Dumont. So be prepared with a bucket of candy to hand out to the little duners and get into the Halloween spirit with your costumes and decorations. It's probably one of the most festive weekends of the season. Last year was one of the biggest turnouts in years. With all the extra excitement it's easy to get carried away out there so don't forget about the 15mph camp speed limit and general rules of Dumont. Look out for each other, keep your head on a swivel, and practice safe duning! We want everyone to have a fun weekend out there without anyone getting hurt. If you plan on visiting Dumont any time between Oct 24-Oct 30th, you will need a holiday pass. 1. You can purchase a season pass with holidays ($120) or a weekly holiday pass ($40) good for the Halloween weekend dates from a participating off-site vendor. See a full list of vendors on our passes page. Don't Miss the 1st Annual Trunk or Treat! Hey duners! How has your summer been treating you? Have you been spending your days at the lake or river or have you been seeking higher elevation to dune or shred some trails? Whatever it may be, many duners always have one thing on their mind and that is DUMONT. "When is the first trip of the season???" Even though it's the middle of summer, people like to start planning out the next couple months and we have already been getting emails about Halloween weekend. Can you believe it's only about 100 days away? Well, I'm here to tell you we've added all the big holiday weekends to our events page and calendar so you can plan out your season well in advance. Halloween falls on a Tuesday this year and as per tradition, Halloween weekend will be the last weekend in October (28-29th). Those to-do lists always start to creep up on us and nobody likes working out in the heat, but if you start little by little and practice some preventive maintenance, the lists don't bombard you a couple weeks before the first big trip. Although it this is a post from last year, it is a good reminder of the things we should keep in mind as the sand season arrives. Every June there seems to be a break in the triple digit temperatures allowing Dumont peeps to squeeze in a nice, cool morning dune run. It's been a couple years since our last group "Dune in June" run. Although it's not looking like most of us on the forums are ready to head back out to the sandbox this June, history is repeating itself with that huge drop in temperature. By late May, Dumont is already 100+ degrees. Come June, the highs are 115 or more. There's always that one weekend though where the wind blows right before a heat wave and the highs are typical of what we see in March! Take a look at a screenshot of the Weather.com forecast for Tecopa. This Monday is only going to reach 83°! I sense some people might be "sick" that day. Looking for others to go duning with? Post on our Dumont Happenings forum and you might just get some takers. 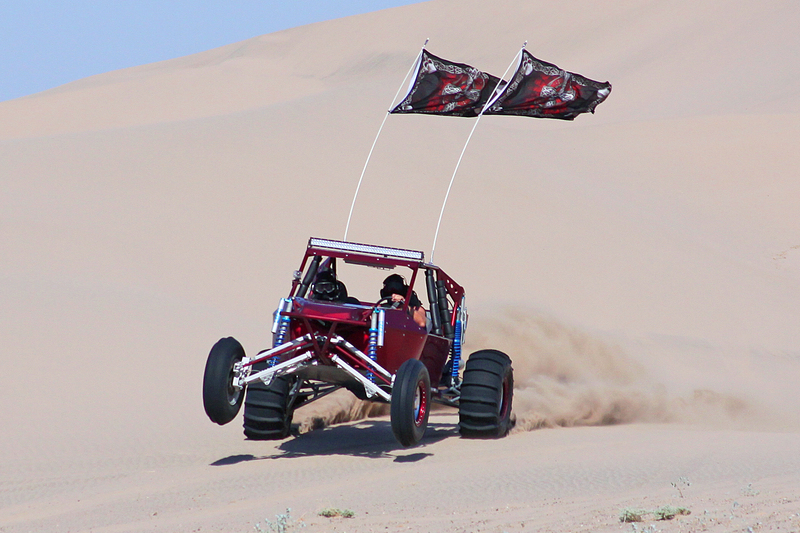 It was a quiet Easter weekend out at Dumont Dunes. Most people have already wrapped up the season and called it quits. The warm April temperatures tend to keep most people from going out, but for those who made the trip, they had some great weather and some awesome sand. The daytime temperatures were mostly in the 80's, still plenty cool enough to dune. With no crowds, the sand was typical of what you would expect in the middle of summer. There were hardly any tracks and the dunes were full of razorbacks. It's always sad to see the season come to an end, but there's always breaks in the weather that allow for a quick fix. You just have to have the sand toys ready to load up and go! This year's cleanup went better than expected by a long shot. Over 150 people showed up to help pick up trash throughout the camp area and dunes. Some people might not think that sounds like the ideal dune trip, but the cleanup is much more than that. It is an annual event where the duners get together as a small, tight-knit community and give back to the place they love. 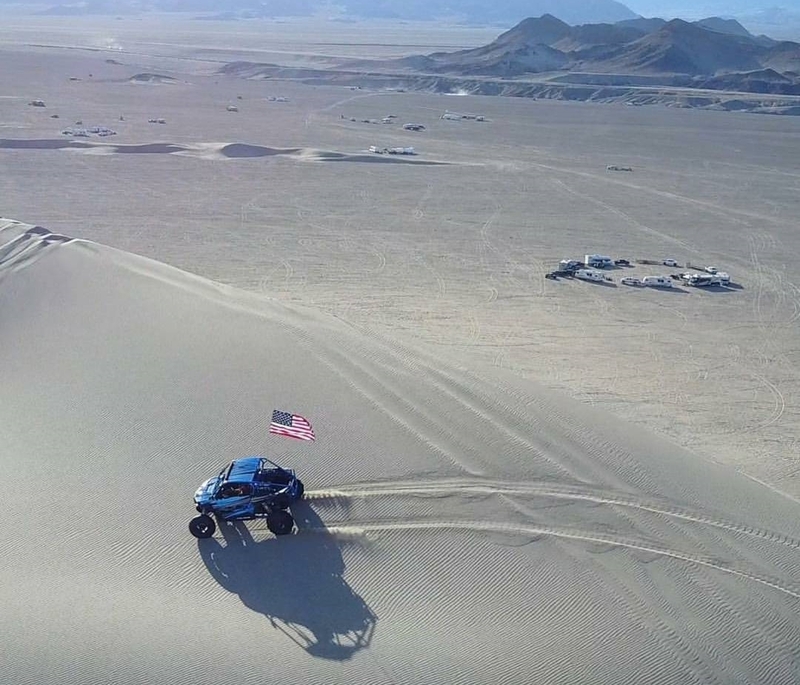 With the efforts of Barstow BLM and the Friends of Dumont Dunes organization, it has become a tradition that has been 15 years in the making. Several friends and families gathered on Saturday March 18th to do just that and it was a hit! Registration began at 8:00 AM. Duners trickled in and signed up with the BLM to volunteer for the morning. Gloves, trash bags, and even grabby sticks were supplied to assist those who were picking up trash. Every volunteer got a wrist band, which gave them a free pass for the weekend as well as a free lunch provided by Friends of Dumont Dunes. In addition, each bag of trash collected would give them a quick draw ticket for the chance to win some great prizes. Many duners scattered out throughout the camp area since the trash seems always be near the fire pits, but some people even went out to Comp Hill and combed the outskirts of the dunes to fill their bags. The most common trash seemed to be empty ice bags, plastic bottles, debris from fireworks and sky lanterns, and tissue/ toilet paper stuck in bushes. So keep this in mind next time you are out at the dunes. Much of that trash gets left behind or blown out of camp. This may be a disappointment to some, but sky lanterns don't make it to heaven. They go up and then they come down and litter our desert. Making Dumont a cleaner place, one piece of trash at a time. It was gorgeous weather and I was just happy to be out there helping out. While out on the north end of camp, this little guy came up and said hello. I thought for sure he'd run away before I pulled my camera out, but he didn't even flinch. Small bushes were a popular trash trap. The large dumpster was provided via Barstow BLM. Bags upon bags of trash were collected and tossed in. You'd be surprised at some of junk that is left behind out there by litterbugs; a roll of carpet, a car fender, clothing, a tire, a coloring book, CO2 cartridges, and much more. There was a plaque given for most unique item found and that went to the person that found a fishing pole! Who brings a fishing pole to Dumont? This was my contribution for the day. A full bag of trash plus a few strange items like the coloring book, a little girl's Christmas dress, a timing belt and an ugly thermal. Everyone had their vehicle of choice. I used my buggy. Some used their vehicle so they could run their A/C. Lou used his ATC70! By 11:30 AM all the trash was collected in the dumpster and everyone gathered at the BLM Ranger Station for lunch, a public meeting and quick draw. The shade structure helped out tremendously this year. In year's past, we would have to stand out in the sun or haul our EZ UPs over to the event area. The BLM has put together quite a nice compound with our user fees; money well spent my my eyes. Everyone lined up for lunch. The new president of Friends of Dumont Dunes, Jason Ardenski, and his family donated their time to serving up a great backyard style BBQ lunch. Tri-Tip sliders, ballpark-style dogs, corn, beans, chips and cookies were provided. Jason went above and beyond into making this happen. He forked out money from his own pocket into making sure this was more than just a cheap hotdog and a water type lunch. He brought out the good stuff with very little time to prepare. The whole family was very professional and you would think they owned a restaurant the way they made sure each and every duner was handled. Jason's BBQ setup and catering equipment was impressive. We can't thank him and the whole family enough for what they did. Jason's father Tom, Jason's son Gavin, daughter Libby, Jason Ardenski, and his mother Kay. Everyone was grubbin and more than pleased with the food! Sandcrab's crew approved! After lunch, the BLM held their open-to-the-public Dumont meeting. Members of the DAC (Desert Advisory Committee) were in attendance with the BLM to discuss items such as the budget, safety concerns, Dumont user issues, and more. They keep the users informed with the management of the area that they frequently use. Some concerns in the crowd were camp speeders, off weekend law enforcement and the possibility of providing dumpsters on holiday weekends. These things will be discussed in more detail at the next meeting. New Friends of Dumont Dunes president, Jason Ardenski, had a refreshing sense of enthusiasm as he discussed his new position and plans for future events and volunteer efforts to keep Dumont a fun and safe community. Speaking of new FoDD members, a brand new vice-president and secretary also stepped up to the plate, Heather Siders! We can't thank them enough for their dedication to keeping the FoDD organization alive and active. Jason said it best with the photo below so I am just going to paste his own words. Once the meeting was over, a table of goodies was brought out by FoDD. Jason rounded these items up himself at the last minute from some great companies that were willing to donate to the cause. Kartek Off Road was generous enough to provide a ton of shirts, hats, koozies and 5 gift certificates! Rugged Radios stepped up and donated two radios, a gift card, duffel bag, hats, stickers, koozies and a banner! Even Jason's parents (also Friends of Dumont Dunes members), Tom and Kay, donated pop up trash cans, chairs, a tow strap, some tie downs, booster cables, and a fire extinguisher. Last but certainly not least, Jason personally donated several items such as a 52" LED light bar, LED flashlights and LED rock lights. His company, Impact Signs in Victorville, CA, in conjunction with Lynn Construction in El Mirage, CA even donated a 2017/2018 Dumont season pass. Impact Signs also donated some awesome RITC tumblers. Plaques were given to those who collected the most bags as an individual and also as a group. In addition, there were winners for most unique item and largest item found. Jason Ardenski (president of FoDD) for EVERYTHING he did. As we dive into March, we start to see quite a change in temperature and weather out at Dumont. The seasons change quickly out there and the cool days of duning are all of sudden numbered. The dune season seems to come to screeching halt quicker than we would like it to. We're already seeing 80+ degree days and an abundance of sunshine. There's no doubt this has been a funky season for weather. Since we've seen plenty of days with cold rain and wind this winter, the longer warm days actually seem very inviting. As of our last trip out (March 3-5), the flowers are already starting to bloom. I would guess that by cleanup weekend, we'll see fields of yellow and purple flowers. So keep an eye out. Dumont is going to be full of color over the next month or so. It's time to seize the weekends of spring and make the most out of this dune season before it's over! Don't forget to set your clocks forward an hour on Sunday, March 12th. Begins at 2:00 AM on Sunday, March 12th. 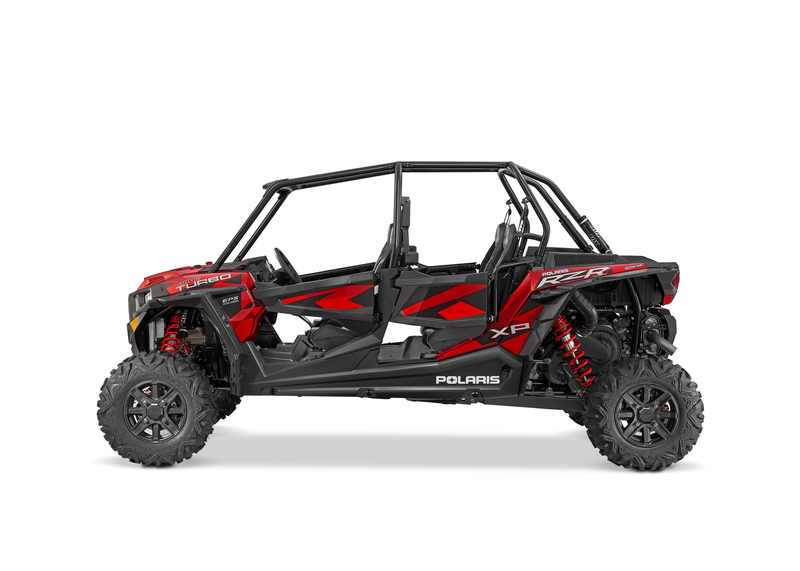 Polaris has issued another recall involving the RZRs. According the the recall, "The vehicle engine can misfire and the temperatures of the exhaust and nearby components can get too hot and cause the components to melt, and/or a contaminated brake master cylinder may cause unintended brake drag, posing burn and fire hazards." Distributor: Polaris Industries Inc., of Medina, Minn.
Dumont Dunes has many landmarks that duners commonly refer to; the North Pole, Comp Hill, Banshee Hill, the Superbowl, etc. The North Pole has been a popular destination for riders for years. If you've been to Dumont, chances are you have ridden out there and visited the mailbox. But how about the South Pole? Have you been there? Back in 2006, some of us from DDR felt we needed an additional landmark. Here is a little history of the South Pole and what it now looks like as of Presidents Weekend 2017. A group of us from DDR decided Dumont needed a South Pole. After all, how can we have a North Pole with no South Pole? We wanted to have another landmark where we could ride and meet up with others from the site. We picked the south-most corner of the dunes where it was still legal to ride. Located out in the rocky sand hills overlooking the Salt Creek Hills and Sulurian Valley, it felt like the perfect place to put it up. You could get there from the finger dunes that connect to the big dunes in the south or you could take the sand highway on the eastern edge of the dunes. Another option would be to ride from the camp area via the trails on the back side of the rocky hills. The original South Pole was simple. It was just a red pole with some reflective stickers for visibility at night and some DDR stickers of course. We hauled the necessary tools and supplies out with a truck and after a little group effort of digging the hole, the Dumont South Pole was established! For a while, it was new to most and we made it game for others to find and post a picture next to it. Although it's extremely easy to find, some still had no idea. Trinkets and items started appearing on the South Pole. More and more stickers were placed to decorate it and give it some character. Riders would visit the South Pole, kick back and enjoy the nice view of the dunes. It offered much better looking backdrops than the North Pole. 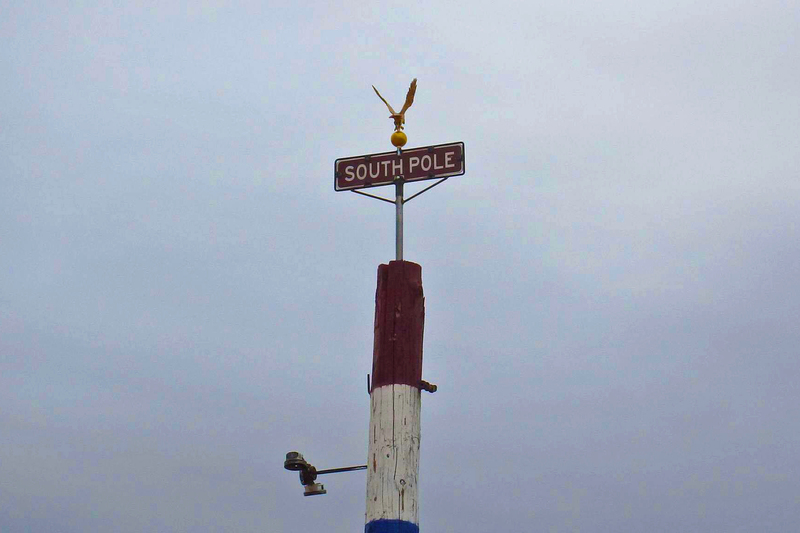 For many years, the South Pole was used as our meeting place for DDR Meet & Greets. On the Saturday of every holiday weekend at 2PM, DDR members would meet up at the South Pole to say hi, meet some new faces and chat for a bit. It was a fun and social informal meet up that many would normally look forward to. Some additional members of DDR decided to add a mailbox. Since the kids wrote letters to Santa at the North Pole, they felt the South Pole would be a great place to write the military troops. DDR member, termiteslayer, took it upon himself to collect and mail the letters each time he went out. Over President's Weekend, the "Regulators" group gave the South Pole a face lift. A supersized pole was erected and put into place. A large telephone pole, painted red, white and blue, was garnished with buggy parts that have been claimed by the dunes over the years. The parts were made into art to resemble a person, a dog and a buggy doing a wheelie. Up top sits a nice, big "South Pole" sign. They used two RZRs to hoist it into place by means of some cables and eye hooks attached to top of the pole. Great job on the Regulators part in reviving an old tradition with the passion we all share. It's group efforts like this that make Dumont a fun community and place to be a part of. Now that you know a little history of the South Pole, stop by the next time you are out at Dumont Dunes and be part of the tradition. It's that time of year again. Time to give back to the place we all love. Friends of El Mirage and the Barstow BLM invite you to the 15th Annual Dumont Dunes Cleanup March 18th, 2017. Round up your dune buddies and make a weekend out of it. Come lend a hand and help keep Dumont nice and clean, the way we all like it. Cleanup will begin at 8:00 AM and there will be a BLM/ Sub-group meeting open to the public. 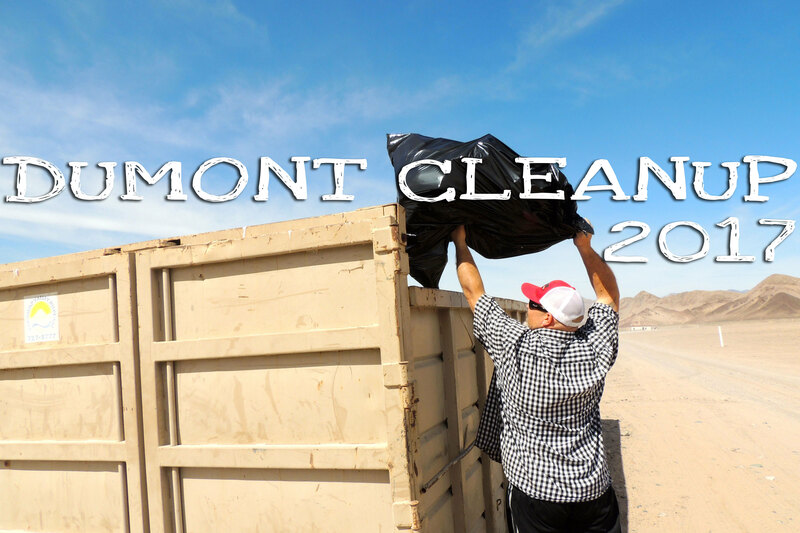 Lunch will be provided for all cleanup volunteers and will get a free entrance to Dumont Dunes that weekend. You must show your wristband upon exiting the dunes. This year it seems the forecast of rain scared away most of the regulars that go out to Dumont for Presidents Weekend. Others were already dedicated and going out regardless. Thursday afternoon the weather couldn't have been better. It was business as usual at Dumont with smooth sand and clear skies. There was hardly anyone out there that early. Vendors rolled in and got set up on Vendor Row. Come Friday morning, the cloudy skies indicated a storm was brewing. Some light rain came in and sprinkled the dunes for a few hours. Duners grabbed their camping spots and filled in close to where the action was going to take place. There was a short break in the weather. As most people call it, "the calm before the storm". There was no shortage of Presidents Day spirit with these guys! And then....WHAM. The W came in with a vengeance. Gusts over 35 mph blew hard all afternoon and into the night. On Saturday morning, Dumont resembled someplace out of a science fiction novel. Low lying clouds and fog hung over the dunes. Although it rained for several hours, many still went out to play. Duners showed up at the hill with their trucks, umbrellas and any other way they could stay dry to watch the Jeep hill climbs. As the day went on, the rain finally subsided. The best part of a storm at Dumont is the riding afterwards. It turned out to be a nice afternoon in the dunes. Sunday started off with great weather. The storms were over and the drags were underway. Duners showed up to watch the races and have a good time. 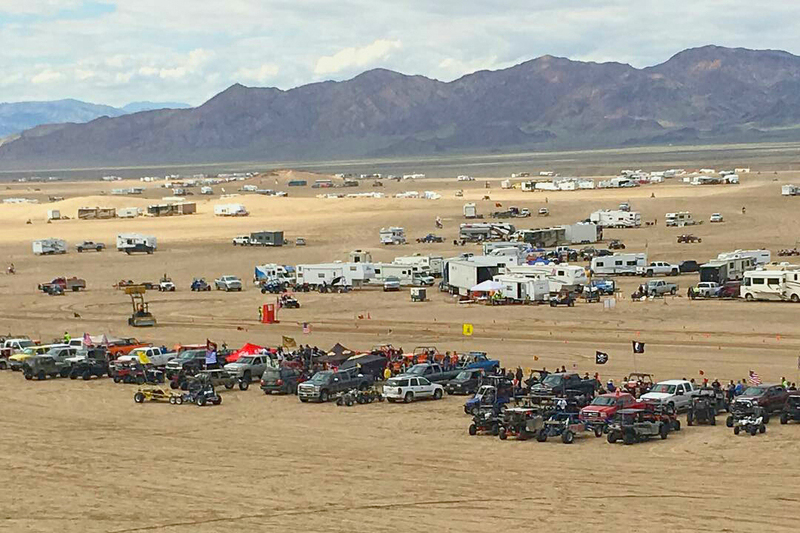 Although the poor weather scared most of the duners away this year, the Jeep drags still attracted a decent crowd. The wet sand worked in favor for some of the dragsters, others not so much. Check out the wheelie that this Blazer pulled during one of the races! Talk about a wild ride. This year's President's Day t-shirts by California Casuals featured Trump driving a sandrail. Another great sunset closed out the weekend. We thank everyone who sent in all the great photos and video from the weekend!